You could say she’s lived a charmed life. She’s traveled the world, picking up awards and accolades wherever she goes. Senator William Fulbright himself attended her farewell party in Washington, DC. Yet, for Clark Honors College professor of practice Barbara Mossberg, who returned to teach at the UO in 2013, success is often measured by the intangible—the “heroic spirit” or the color purple, or by the impact she’s had on thousands of students who have attended her classes. By her second year, Mossberg had achieved near rock-star status. 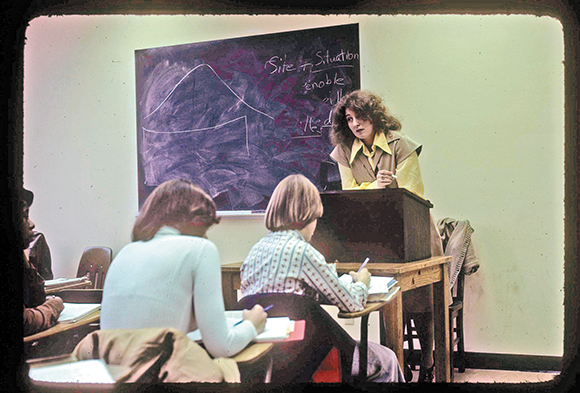 Her literature classes overflowed with eager students, a book she’d published on Emily Dickinson had been well received, and she won a university-wide distinguished teaching award. Recognizing her leadership skills, the university gave her opportunities to advocate for the humanities, and in 1982, she was awarded a Senior Fulbright Lectureship—the Bicentennial Chair of American Studies at the University of Helsinki—that propelled her on a life-changing global adventure across Europe, teaching and lecturing on American studies. After returning to Oregon and helping organize the first American studies program at the UO, she received a federal appointment to represent the university in Washington, DC, as scholar in residence for the US Information Agency. More appointments and awards followed, including a second Fulbright Chair, serving as a senior scholar for the American Council on Education; associate provost at Hobart and William Smith Colleges; president emerita at Goddard College; and founding dean and professor at California State University at Monterey Bay. She continued to lecture, advocate for the humanities, and teach, all while raising a family. Meanwhile, her ongoing efforts to integrate the arts, humanities, and sciences laid the foundation for her philosophies on the metaphor of purple. After 40 years, Mossberg had woven together an intricate tapestry of global connections, but despite all the places and events and distinguished appointments, it was to teaching and Oregon that she felt most connected. In 2013, “like Ulysses returning to his beloved Ithaca,” she returned to the UO to teach in the Robert Donald Clark Honors College. “I was always working my way back,” she says. “I wanted to bring to Oregon the fusion of arts and science and leadership and epic [literature] and poetry.” Mossberg further completed the circle this year, returning to Helsinki to participate in the 40th anniversary celebration of the Fulbright Chair. 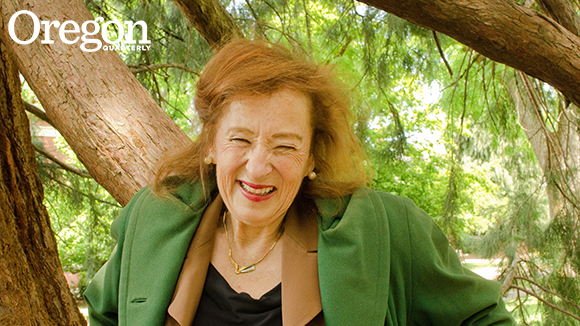 On campus, you may find Professor Mossberg—with the same joy and enthusiasm as her 26-year-old self—musing beneath one of her favorite trees, or picking up camphor leaves, or happily ensconced in a classroom, on fire and eager to share “the purple” through her unique brand of interdisciplinary, cross-cultural courses with titles ranging from Imaginary Gardens with Real Toads in Them to That’s Wild! Eco-Epic and the Green Imagination.